It would seem that anyone that is serious about these materials is desiring to attain a Sovereign Integral Perspective. The materials are all about behavioral intelligence so any reference to our behaviors/actions is relevant to discussion of, and alignment with, a SIP. “We live in the non-linear, multi-dimensional, intersecting planes of separate realities that self-organize and transform into the world of Oneness and Unity, but only when we operate in the surety of our hearts will we experience this unity. The heart is not given to ideology or frameworks of rigidity. It operates in tandem with the hippocampus and neocortex to sense, decode, and respond to our local universe and multiverse in utter fluidity. It seems to me that taking a 'direct, sober, truthful assessment of our behavior' is 'getting with the program'. “This is not a mental exercise or a pledge you salute and then go about your business as before, forgiving the hypocrisy of believing one thing and acting another." This is the essence of this situation. We want to proclaim or imply (through our writings or quotes) how "good", "enlightened" and "transformed" we are yet our surface expressions are not aligned with virtuous behavior. So, from this perspective "discussing the wmm" while not walking the talk / not expressing authentically aligned behaviors but rather practicing the old paradigm with mind/ego personality reactivity, is less-optimal relative to our evolution as S.Integrals. It is therefore understandable, from the same perspective, on why some feel that a better environment of discussion, with greater behavioral alignment - true to James two-fold intent, is required. We are good, spiritual beings, not by the expression of our behaviors, but by our intrinsic nature—our origin. We are each allowed access to this higher knowledge not by how we act, but by simply being what we are. because when you do (REALize who you ARE) ... then you will be expressing your TRUE identity... and you will recognize FS in others, no matter how they behave. The HVs are not "behavior" (behaviorial intelligence reveals why you "act" the way you do) ... they are how the individual expresses (uniquely) the Frequency of FSI flowing through them (and how limited (or not) their understanding is)... while it is true, that they need to be "practiced" ... that is only because we fail to express them "authentically" and continued to alter that "specific" frequency , due to the HMS's programs that we depend upon ... once we "tear down the walls" that distort or scramble this "tone of equailty" and get aligned, they will flow, in their genuine form ... this results in our "behavior" expressing FSI uniquely in its authentic frequency ... that can more easily be recognized - IT was always there. Last edited by starduster on Tue Jul 06, 2010 2:43 pm, edited 1 time in total. no one can do that for you ... nor are we required to conform to your expectations ... we were created with an Individuated Consciousness ... that we fragmented ... if you are not willing to self-create a SIP ... it is not anyone's FAULT but your own... "nothing prevents you" from developing a Wholeness Perspective that is not judgmental... and which does not reject the WMMs. ...along with how (c) distorts (b)=>(d). In this understanding I also see the reason of why this is happening and how the individual progresses relative to time and why this is a necessary experience for them that will get them to a more experientially evolved place, in time. By doing this I can support (energetically) their spiritual evolution, even by factoring in their apparent relatively unfavorable surface expressions - which are necessary for them at this time. However, since we are all time-shifted, what one requires at a given time is not the same with what another requires. Masquarading my ego personality as my Self for example, is not one of my concerns. When James says "be yourself" he doesn't mean to be your human personality. You have to dismantle the personality and approach life with a new way. One practical way of doing this, is notice your face when, say, you are writing something in a forum in the heat of the moment. The face will start to have various tensions. This is the ego, engaged in battle-mode and it's effects expressing in your own body. But it can also be the other way around (body affecting mind). These two-way relations can be used in such a way: Take a deep breath and relax. Now relax your facial muscles completely. Blank any expressions from your face - like you are sleeping. Samantha did the same prior to an RV. (blanked the face so the personality is suspended and the higher faculties of the human instrument like higher mind/heart could come into play by providing her intuition). By doing this blanking technique, you are suspending your ego-personality for a period of time until you understand the difference of it being engaged, and it being suspended. It reflects on your own behaviors and how you approach others. Try it for a period of time and check it's results. Especially before expressing - you'll see that the ego tension will be eliminated. If you want to later shift this into a more positive, rather than neutral gear, try the somewhat harder task of emulating the S.Integral face on your own face. This all knowing, powerful and deeply compassionate smile. I think this is relevant to this topic, it's from the Creator Section of the Q & A section of the WMM, Session 3, part of A38. "Informed entities are non-aligned for a good reason. They desire to be facile and fluent in their evolution of thought and in their absorption of new energies. This is noble. It is not something to be restless of, or disrespectful to. Rather, it is a sign that you honor the mobility of your consciousness more than its indoctrination. Your “true place” is not a place, position, port, or location at all, but rather a projection of the attitude or outlook of the Sovereign Integral consciousness...."
"...There is one additional suggestion I would like to share with you. We are entering a time when the ability to destroy the old and create the new is a skill set of unparalleled value. It takes great insight to detect the weakness of one’s own work and destroy it, while creating a new work in its place. Light, as it passes through prisms, becomes degraded over time and matter. In other words, informed entities will disperse a brighter, bolder, more visible spectrum of light if the light source is of their time, space, and matter. I am of the opinion that the power is self-contained in the new. There is only the effect of dilution by constructing bridges and hybrid models. This work is about the destruction of the old as much as it is about the construction of the new. This is yet another trait of the non-aligned – the willingness, even eagerness, to flush the mind of the old in order to attract into oneself the new." CV still insisted on the old paradigm for the hodge podge and mixed bag he used of the teachings of many gurus and old masters that weren't necessarily relevant to these times we are in and he insisted on the mixed bag more than any thing of the WMM. Some of us know our roles here and play them to the best of our abilities and are systematically breaking all ties to the past that are no longer relevant now which demands acute discernment and high flexibility if not an openness to change even if having to turn on a dime in a nanosecond.We know who we are and we don't need anyone's permission or approval to do it. We make the effort and do the work. The new paradigm is not about "punishing" those in the old paradigm. The "destruction" is mostly concerned about things that are related to one's own self (self, not Self) and it cannot be enforced upon others. Who is anyone to say that a specific approach is wrong for any other person? What others are doing is always appropriate given their time-shifted-position. You may disagree with it or not resonate with it from your own time-shifted-reality, but nonetheless it is necessary as an experience for the other - it shouldn't be judged but rather understood. As for the mixed bag, may I point out that there are multitudes of materials (encoded or not) that fuse with the WMM. For example the Animatrix world record video that I posted a few pages earlier, is an encoded work relative to First Point. It can be found since 2003 - which is 5.5 years earlier than James's speech on First Point. One could wait for James to spell it out directly, or one could see it in a more "encoded" form. First implication of this would be that having multiple sources of information reduces dependency (although there's always the "externals" dependency). The second is that the WMM act as a tool of enhancing sovereingty. Therefore once they have catalyzed you to fly on your own, then you don't really need them (the WMM functionality is in giving you "wings" - once you have these wings, it's time to fly - there's no need to sit around and continue building the already built wings!). That the nature of catalysts. They participate in chemicals reactions to produce an end result. The end result justifies the existence of the catalyst in the prior phase (chemical reaction) but obsoletes it's necessity of the catalyst in the end-product stage. That's one of the reasons why I made the fictional scenario of a WMM-worshiper hitting the WMM on the head of a person who is catalyzed as a S.Integral and who doesn't need them anymore => he is in the post-catalytic stage, the cocoon has been turned into a butterfly. You and Watcher, seemed pretty sure that James was an impostor, but over the years, you have seen everything he revealed (shrouded in metaphor) manifest ... at least all the "bad" stuff ... so what about the good stuff? experience any of that? The very fact that you are back, must reveal that there was something in the WMMs that gave you sanctuary ... or you wouldn't be here. how are things in Greece? or are you trying to distract your SELF, by distracting us... sorry to be the one to tell you how transparent your agenda is ... but after dealing with Nat and his faithful side kick, for the past five years... we've had all the "punishment" / "practice" we need, dealing with distractions ... " the eternal dance with energy" needs harmony, not that monotone you are singing. Star he still thinks that his logic and reductionist approach can work here after all these years and especially with the advent of Heart Intelligence which isn't logical or even reasonable to such reductionists.Actually its quite foreign to them and not accepted if not comprehended. It's why I won't reply to him because he still thinks the intellect/mind is the predominant mode of communication here. Like I said earlier, he has a lot of catching up to do and it isn't as if he is not capable either, it's choice and either you resonate or you don't and if not have the grace to allow those here who do to have discussions unemcumbered with the intellects need for argument and judgments. Alex you are just arguing for your limitations . how are things in Greece? or are you trying to distract your SELF, by distracting us. Actually, contrary to what you hear, Greece is not in chaos or bankrupt. So for the time being I do not have reason to "distract" myself more than the average American. Just to make a point: Greece population with food coupons <50k in 11 mn (0.4%). USA: ~39 mn out of ~310mn (>12%). Star he still thinks that his logic and reductionist approach can work here after all these years and especially with the advent of Heart Intelligence which isn't logical or even reasonable to such reductionists.Actually its quite foreign to them and not accepted if not comprehended. The heart is not irrational. It is about a higher order reasoning which comes from expanded data sets and ways of processing. For example "loving a stranger" would seem irrational to one's mind. But the energetic heart loves another because it applies a higher order reasoning. It's expanded data set says that the other is a part of the All-That-is-One and as such, worthy of equal love as one's own self. I respect your connection with your heart and mind Alex ... but it seems very controlled from where I am sitting... maybe too much self-analysis ? I appoligize, I may be wrong about your doubts about James...but I discern doubts now ... if it makes you feel any better, the WMF doesn't meet my expectations, either ... I expected it to be crowded with people who "get it" and who appreciate this opportunity to expand their consciousness ... but I guess it sounds too much to them like it's "too good to be true" ... a trigger phrase . Question 12: What is the best and most accessible way to obtain and experience higher powers or the 'super' human state of mind. By this I refer to anything like majick, excelled intelligence and the likes - I think you probably get my gist. I'm asked this question (or variations of it) more often than any other, and my answer is inevitably the same: Align your personal objectives with the universal objectives. 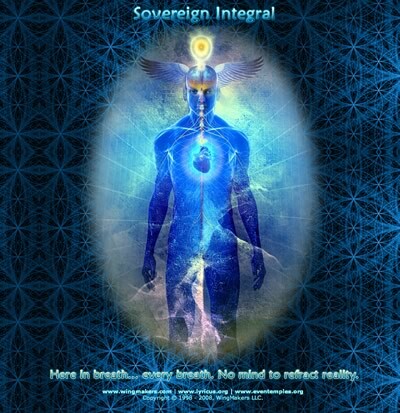 In other words, if you focus your efforts on finding the sensory data streams that resonate with your consciousness and lead to your self-mastery, these same data streams will illuminate the universal objectives as they pertain to the species of which you are a part and the planet upon which your species exists. Once this is realized -- even dimly -- you can align your personal path with the universal. When this done, you accelerate at the rate that is optimal for your consciousness, while remaining in balance. Focus on alignment to that which resonates with your core instinctual sense of the universal objectives. ... If this resonates with your core sense of purpose, then align to it. This will accelerate, amplify, and catalyze the blueprint of your Sovereign Integral state of consciousness. too simple? ... how do you perceive this opportunity of a lifetime, knocking at your door ... oh, I see, you only feel safe, discussing the messengers. not the the message ... because you have nothing to compare the message to .... there is nothing on earth like it - that gives you the opportunity to be self-realized, just by getting into alignment with Universal truth... especially not for free. First Source is not banned. In Source Reality (earnestly and frankly), all handles on the door, are devices that open us all to equality. Whose banning anything Russell? First Source doesn't judge either no matter how time shifted we are with each other. Alex I grant you that, and hope not to offend you for I just realize this now. Bridging gaps is not always an easy thing to do, but it can and is being done. We can do it. Alex I grant you that, and hope not to offend you for I just realize this now(time shiftedness). Bridging gaps is not always an easy thing to do, but it can and is being done. We can do it. Here to learn to get along with each other I/you ..We are expected to make mistakes and then rise above them to find Unity....not found in our own beliefs that are separate from the Chambers.....but in OUR beliefs that are at One in unison with the Chambers....that Nathan got himself banned.....only from the forum and NOT the Chambers is because he refused to make the distinction necessary ...and once he does...he shall be immediately reinstated...his choice ....that only applies to this forum and not the inner Work that one does not need to belong to any forum to participate in.....just that the contact with others on the same path....tends to make the shared journey that much easier to resonate to.....truth is if one of us makes a discovery....through shared harmonics...the knowing is available to All. MarkZ are you trying to make the so called "Chambers" a religion now too?????? You read or study a little bit of these WMM and then think you know it all. You demonstrate quite eloquently what the saying means and shows, "That a little knowledge can be a dangerous thing." You still try to fit what little you study of the WMM into your beliefs of the past. These materials have no rival. You have to empty out your past beliefs completely through examination of them before you can experience the full benefit of the energetic transfers from these materials. Do you think you can do that? Few do. These materials are not understood or studied with a mind/personality/intellect they are taken in by the whole being. And it is only in that way can they benefit from them optimally. And the past will always interfere with the transfer and it will not be complete, just like how little you understand. I am not trying to offend you. You seem stuck in a rut for how much you repeat the same old same old programming. Fear of change is a big impediment in optimally benefiting from these materials, that and the inertia of a sense of false security from the programming of the intellect/ego/mind and the lack of heart there is very very obvious if not lost. Shay....I honestly think you do not understand anything of what i say....and are so locked into your studies....as to time spent not knowledge gained that your arrogance gets in your way of being able to be anything more than a parrot....of the words you continually fail to get beyond......Chambers are alive......tis your ( is it ? )need to structure that which needs freedom that is the problem....yours not mine.....how in the world are you coming to the conclusion that iam trying to make the Chambers a religion....and then going off on a tangent based on a false assumption......would be a good idea for you to go silent for awhile...and look at Chamber 2....to gain entrance. to that which to date has eluded you.....artwork is a gateway to something wonderful .....and like it or not....they the Chambers are open to All......and guess what .....your approval is NOT necessary for them to enter ......funny thing is ...you have no idea how much you remind me of Athena....albeit you are a much nicer and kinder version of the same energy pattern....that at its core is anti freedom and thus an extension of the HMS you BOTH so like to pretend you are against .....sort of makes you both from my vantage point a supporter ( conscious or not ) of the protocols of Zion that are 100 % anti Wing Maker......and 100 % pro Animus that i do think are more in alignment with your ( is it really ?) thinking then you care to admit to yourself.......no doubt your mind is able to grasp the words of the WM materials.....but as your heart is closed....you fail to understand. the true meaning of what is behind them .. Fear of change is a big impediment in optimally benefiting from these materials, that and the inertia of a sense of false security from the programming of the intellect/ego/mind and the lack of heart there is very very obvious if not lost. My edit is in blue. As we know from a posting that James is working on a new fictional piece to come out in the by the year of the year, and we know that certain energies will try to delay it by this type of distraction for those working on it. Has James' new fictional piece come out? Sorry, been out of the loop for quite a while for various personal reasons. Is he still.....has he re applied and not been accepted back. Nathan and all his registered names only had his name Nathan banned. The Nathan handle banned himself by his actions. Why are you all trying to get his handle unbanned, when you can see by his postings that only the name Nathan was banned not the persona of all his other names he can use on this forum? role of the Animus at this time in our history. It is all about intention, what is the intention of the many personas of Nathan and why did he register so different many names? Why does he wish to label persons that see what he is writing as an injustice to the basic foundation of the Lyricus Teaching Order materials? the Heart and all how use the UKF. the Heart and all how use the UKF." Let me focus on this quotation. You may find it silly that I attach such a meaning and significance to it - but I would like to ask you to consider this. I hope you will see why when you read it. I think the society and individuals should be constantly checking those who posses the power to control them. It is of critical importance. Even if it is an internet forum (and especially t h i s internet forum). Moderation is a form of control. Montesquieu explained : whoever has the power(control) has the tendency to abuse it (and not necessarily knowingly/conciously - which is more relevant to this case) - and even if it isn`t abused at all - I don`t know if there exists any way for a control institution to be harmless if its decisions and funcionality is not effectively directed by the collective will of the society. I think what we should exercise here - are the ways of organizing the society from the perspective of the Sovereign Integral - which is ruled by the collective will. NOT the social order of the current society and its ways of governing. It doesn`t matter how bright the moderator (or any other control institution) is. The decision making should belong to US - not to the ones who posses power (control), in this case - moderator. We do not have the practical power to exercise a complete and authentic collective will yet - however, we should have as much influence on the decision making as a collective as possible and this influence should exemplify Our True Self as closely as possible. The point is - the moderator SHOULD be sensitive to any objections/suggestions - any of those should be genuinely considered. We need to be able to and we should try to influence the moderator if his decisions go against the will of the community. We do need to write letters to the moderator if we wish to influence a decision. I realize that I am being confrontial here because this goes directly against your quoted statement, and I assure that I take no satisfaction from this fact. I understand that what you propably meant was to point out that our moderator is a person who has all the necessary qualities and is truthfully applying them in his role as a moderator. I appreciate that and I have a highest respect to your opinions. What I`m intending to convey in this message- is that a moderator ( or any other external control institution ) - cannot truly fulfill his role unless he is truthfully sensitive to the will of the community - and unless he is willing to accept it`s influence and to change/modify his decisions so that they match the collective will ( as closely as possible ). It might seem like a detail, not worthy of even mentioning - but I think that this notion would be a judgement of the ego. Whenever a perceived injustice enters one`s local Universe - this is a huge deal. I classify a proclamation that moderator should not be influenced as an injustice because I think it is not entirely harmless and your proclamation is powered by high authority, which could influence the perceptions of some of our members in a way that I recognize as not desirable. P.S I can appreciate that you may have a different point of view on this matter and as such - I would like to underline the subtlety of the topic we are discussing. It is prone to subjective interpretations - trying to form an objective consensus/agreement in relation to such matters without falling into separation & polarity can be a real challenge - and I think this characteristic may be one of the fundamental issues in this century. I think the Wingmakers forum should serve as an example, proving that it can be done, with increasing ease and virtuosity. If I will ask you - how exactly does banning Nathan contribute into bringing Unity and Oneness onto this forum - what will you say ? From my perspective - it only adds to the polarity between him and some of our members and has nothing to do with expressing Unity. It is not an expression of Valor, because there is no detectable expressed Compassion and Understanding that would accompany It. In case of some of the responses that relate to Nathan, there is an accompanying sense of judgement, sometimes a heavy one - and this is not even noticed or taken into account by some. Defining, according to the opinion of those in power, the behavioral borders by the use of punishment - isn`t it the foundation upon which our current, largely soulless, social order operates ? Are we supposed to parrot this way of governing on our Wingmakers forum ? *its necessary to understand how did Nathan`s relationship with the recipents of his accusation did look like in the past. it isn`t like he didn`t receive any judgement (or worse) himself. Of course this is only my subjective proposition, that is used in order to explain what I feel the general outline of expressing Oneness could look like in this case. Why does he wish to label persons that see what he is writing as an injustice to the basic foundation of the Lyricus Teaching Order materials? Again, is judging his motives and behaviors the way to go ? I might just as well judge motives of those whom he judged, especially in the past. Were they always pure ? I find it staggering, how much of a shortage of HV`s we have in this case. For example - noone expressed any apprecation towards Nathan`s idea of writing a book, indeed, the reactions were quite an opposite of apprecation. There might be certain negative views about writing in the language of the mind - but it shows that he is truly commited and resonates with these materials - and is willing to share his findings with us. In a same manner, I don`t feel we appreciate enough the enormous amounts of time that some of our members are willing to spend on adding content to this forum. This signs a real dedication. I might add that we are interested (at least we should be) in expressing unconditional Oneness. We do not exclude anyone, no matter what - from the expression of Our Oneness, which is expanding the limitless intelligence, everywhere. In summary, I think we are in situation where a degree of separation and polarity is occuring on our forum. This is pretty bad, as for the WMM`s students. Nevertheless, these behaviors are understandable and quite natural, given the social order which taught us them, in this way or another, for so many years. I think both sides have their arguments and reasons for acting as they did - and maybe the balance of unwanted actions does not lay in the middle - but obviously it isn`t black&white either. With a careful eye, one can find that there are assumptions, false conclusions, needless accusations and incorrect observations that create a wall between some of our members. This wall prevents them from seeing each others position and hearing each other`s arguments. To bring this wall down - we need to let go of any significance we assign to being right or wrong, to our conclusions about ourselves, like e.g 'i`m transformed' and others 'he is stuck in HMS' ,to our pride/honor, to our judgements or mental constructs we have about others and any other form of any desire that aims at putting us into superior position in relation to others (if you think you are transformed - you need to be especially careful about that). It needs to be remembered - that everyone is doing their best...EVERYONE... and that there is no Nathan, no them, no moderator - there is only not, there are no those who express Oneness and those who do not - there is only YOU. So in the end, who did we ban and for what purpose ? By the way, YOU are the one who wrote the words you are reading right now. If we are talking so much about Heart, HV`s and Unity and Sovereign Integral - it is well past the hour that we start expressing it - in Truthfullness, unconditionaly, in every breath to everyone and everything. Please take into account that my practice of the Heart Virtues is not perfect, far from it. I tried my best though, with a desire to express and nurture Oneness on our forum I truly hope that this forum will once become a place where we will truly help each other in dismantling the walls that separate us from realizing ourselves as One and not a place where we add to the already existing walls. P.S 2 My English is not perfect either. Last edited by Urahara on Sat Mar 19, 2011 2:40 am, edited 1 time in total. This is not a distraction. These are phenomenons of the outer world. It is your reaction to/interpretation of them that is the source of distraction, as explained in the Lyricus Discourse 5. In fact, I think these kind of phenomenons are anything but distractions. They are our interactions with each other, even if it is through the internet - and so these phenomenons are of utter importance because this is where we practice Heart Virtues. At the risk of being confrontial - I will mention that in comparision to that - whatever important project you are working on - it is propably significantly less important. Nonetheless, I`m excited about this new stuff, the wait has been really long : ) We had all the time in the world to see what our patience is made of, though it will propably be something truly awesome.